A society that fails to invest in its children, to protect its land and water, or to build a future is courting collapse. Republicans in Congress and President Trump got their big political victory: a tax overhaul that vastly benefits the superrich and corporations at the expense of nearly everyone else. On one hand, it’s not surprising—GOP leadership had clearly signaled their intent to reward their wealthy donors. On the other hand, it has shocking impacts on children, education, health care, the deficit, and the economy. And, of course, it amps up inequality. Taxpayers in the 95th to 99th percentiles of income get the largest share of the benefits, according to the Tax Policy Center. This fact is not lost on the American public, two-thirds of whom believe the tax overhaul will help the wealthy more than the middle class. The top 1 percent already owns 42 percent of the nation’s wealth. Especially pronounced is the gap between white households, which have a median wealth of $171,000, and Black families, with a median wealth of $17,600. Societies tend to become more unequal over time, unless there is concerted pushback. Those who accumulate wealth—whether because of good fortune, hard work, talent, or ruthlessness—also accumulate power. And over time, the powerful find ways to shift the economic and political rules in their favor, affording them still more wealth and power. The process feeds on itself, growing like a cancer unless stopped by outside forces. Over time, the powerful find ways to shift the economic and political rules in their favor, affording them still more wealth and power. The process feeds on itself, growing like a cancer unless stopped by outside forces. Religious leaders, traditions, or uprisings sometimes play that role. The prophets in the Old Testament called for the Jubilee year—for the forgiving of debts, the freeing of slaves, the return of land to the dispossessed. In the New Testament, Jesus overturned the money changers’ tables in the temple and called on the rich to give to the poor. The Islamic faith has parallel concerns. The Quran says that one should give gifts of money rather than lending money with interest. Interest is one of the most insidious drivers of inequality. In the Pacific Northwest, Coast Salish tribes practice the potlatch; families gain status and respect by what they give away, not by what they possess. In all these cases, a strong sense of shared morality helps combat the natural tendency of wealth and power to concentrate in a few hands. People’s movements have been another way that inequality has been checked. The minimum wage, the 40-hour week, the income tax, and social spending all came about as the result of labor and other popular movements. Scandinavian countries have some of the most progressive tax and spending policies, and these societies thrive, consistently ranking at or near the top of United Nations Development Programme Human Development Reports. Contrast that to the United States, where addiction is rampant, life expectancy is falling, infant mortality is the highest in the developed world, education quality is abysmal, and the country’s infrastructure is crumbling. “Americans can expect to live shorter and sicker lives, compared to people living in any other rich democracy,” warned Philip Alston, United Nations Special Rapporteur on extreme poverty and human rights. An unequal society loses its sense of solidarity and social contract. A society that fails to invest in its children, to protect its land and water, or to build a future is courting collapse. Whether you are a member of a religious denomination or not, there is no way this can be moral. Sarah van Gelder wrote this article for YES! Magazine. 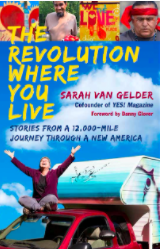 Sarah is co-founder of YES!, founder of PeoplesHub, and author of “The Revolution Where You Live: Stories from a 12,000-Mile Journey Through a New America.” Read more about her work here, and follow her on Twitter @sarahvangelder. Sarah, you write that the corruption is like a cancer that must be stopped by “outside forces.” To which the obvious question here is, What outside forces? Who and where are these forces? The political situation in the United States appears to be getting bleaker by the day. I, along with many tens of thousands of others, am working daily to hold onto hope that our phoenix will soon rise. And yet we wonder how much darker will this dark night be before the dawn of an equitable and morally just country? Thank you for your good work in this struggle. In solidarity we remain!! It’s easy to get discouraged, @SingingBones. We started PeoplesHub.org because our best hope is probably in our communities. We want to do all we can to support the transformational possibility that is to be found there.